Sorry for the delay. WordPress was refusing to publish my posts for a few days, and that got me out of the habit of daily posting. However, I’m listening to a new interview with Shirley Hughes, about her Alfie books and her in general! Posted in Uncategorized | Comments Off on What is this? Something’s going wrong with the actual post, so will this publish? ETA: It did, but now I need to sleep. Goodnight. Admittedly, there are several places in this book that I have not so far visited, but I have some familiarity with enough of them that I could occasionally smile knowingly and other times wonder at how much difference perspective can make. And that is really the point of this book, which details a wandering tour of Europe Bryson made in 1990, and regularly compares it to one he made in 1973 (I think) as a teenager with a friend, as well as an earlier solo journey. I’ve never read any Bryson before, although I have seen various of his books umpteen times on personal, library and bookshop shelves over the years, as he’s been prolific and popular, particularly in the British Isles. Interestingly (to me) my mother just read her first book by him in the last couple of weeks as well (another of his travelogues from the 1990s) and we appear to have had the same impression: that he’s on-and-off funny but rather crude, and that he’s too much of a tourist, barely speaking to anyone on his travels or doing more than scratch the surface of the places he visits. I did my first (and relatively extensive) travelling with my parents, so I suppose it’s unsurprising that like my mother I want to get to know places a little, both by going there for a bit of time and by reading up on it before, during and even after the trip. Whenever possible, I like to go and actually do something (a course, or a job/volunteering, say) in the city/region that gets me meeting people there (often but preferably not only other incomers) and living a bit of life there. That’s not to say that I haven’t done short visits to cities like Venice, Prague and Amsterdam, just that I wouldn’t expect anyone to be interested in my opinions on those cities other than in relation to making a similar-length visit of their own. Perhaps I’m being unfair, since Bryson is quite upfront about how he’s travelling and what he’s writing about, but honestly I’m not really all that interested in the name of the hotel he stayed in and what tourist tat was available. I wanted something that this wasn’t, and I wanted it to be funnier without all the jokes being at the level of stereotypical and stereotyping schoolboy humour. If I were going to give Bryson’s writing another chance I’d probably go for one of his books about Britain (where he’s apparently lived for many years) or the USA (where he’s from), as there are real flashes of insight in this book when he’s discussing places and things he knows better, and isn’t just making it clear how homesick he was by the end of the journey. 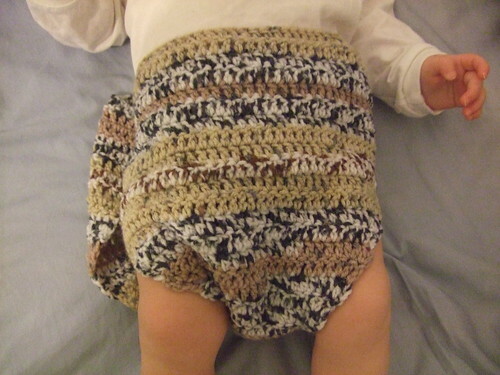 Um, I’ve been thinking as I crocheted it that the soaker (the pattern for which currently only comes in one size) was going to be a bit big. I hadn’t realised until I sewed up the sides and tried it on DD that it’s entirely MASSIVE on her. I do still need to add ribbing to the leg cuffs and waist, and probably a drawstring on the latter as well, but I really can’t see us using this for a LONG time yet. Here’s a book I almost certainly wouldn’t have read if it hadn’t been for BookMooch. Basically I wanted to get something from someone in another country who wanted at least two to send here, and this looked the most potentially interesting of the remaining inventory. Honestly, when I looked at this book it looked like one of those misery memoirs that have become so popular over the last few years but that don’t appeal to me at all. 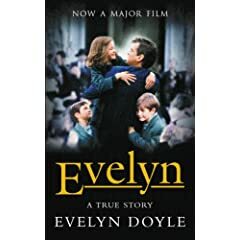 The first few chapters didn’t dispel that notion, since the maternal care provided to Evelyn and her five younger brothers is entirely neglectful and just appalling. However she really doesn’t wallow in that, and is quite positive about the convent care she received, and never negative about that of her brothers (who were in an entirely different establishment many miles away), which considering all the child abuse scandals laid on the Catholic Church and its institutions in Ireland and elsewhere was almost a surprise! Here it’s the Irish state policy (heavily influenced by the Church hierarchy) that are seen to be at fault, and which are battled by Evelyn’s father, to an eventual change in practice and legislation. The book was apparently made into a film, which I’ve never seen but which doesn’t sound all that accurate to the book. I finished the dishcloth on the way to meet the recipient, and forgot to take a photo of it complete, but the one I took before is only missing a couple of rows. I need to get back to the shawl, and then I think it’s time to make something else for my little girl. Soakers would be useful, and I’m thinking a pair or two of longies would go well with a little denim dress we were given for her, until the weather warms up enough for her to go bare-legged. I wish I’d made her a little cowl already, as I can’t imagine putting a scarf on such a little neck, but if it hasn’t been really necessary yet this winter, I doubt it will be. Would it be too distracting from Pesach cleaning to go through my WIPs and decide what I’m doing with them? I had heard of this book, but never had the chance to read it, until someone I got in touch with on BookMooch found out I have a family connection to Guernsey, and recommended it. I am really grateful to her! So I still haven’t written up numbers 18 and 19 on the booklist, because of their topics of war and destruction, and yet I really enjoyed this book, even though it’s decidedly set in the aftermath of war and destruction. This is an epistolary novel, and I wonder might that have something to do with it – people are telling others what happened, and there’s a certain level of reserve and protection involved, although at least some of the horrors of Nazi occupation and the concentration camps are shown clearly. The novel is set in (or at least the letters are from) 1946 in London (with a brief tour of the British mainland) and Guernsey, where lives are being rebuilt after the horrors of war. Juliet Ashton is enjoying the success of a book based on the newspaper columns she wrote during the war, but not at all sure what she’s going to write about next, when she somewhat randomly receives a letter from a Guernsey-man who has bought second-hand a book she had sold a duplicate copy of. 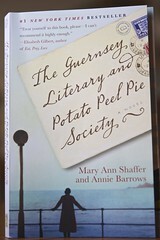 She is intrigued by his mentioning the Guernsey Literary and Potato Peel Pie Society and its coming “into being because of a roast pig we had to keep secret from the German soldiers” during the island’s Occupation and continues the correspondence both with him and other Society members. She also continues to correspond with old friends and others, and we are thus given a fairly rounded picture both of her and the Society. I laughed out loud at several points, and cried a couple of times. The voices are distinguished (some more than others, but there’s a level of realism in that) and believable, and the characters are worth caring about (even the ones we might love-to-hate). Considering the lack of contact between the Channel Islands and Britain during WWII itself, the level of explanations required for the modern reader without specific local knowledge of the history is reasonable, and eye-opening. Another area for me to look into the ‘real’ history! This is one I’m pretty sure I’ll be rereading more than once. This particular novel is set during the first year of WWII, as it had to be for any realism, considering it was published in 1940, and is about a young RAF officer on regular, boring patrol looking for German submarines and other shipping off the English East coast. Between flights he chats up a local barmaid and considers his future RAF career even beyond the current war. All in all this is a nice, positive early war novel, before war fatigue had set in. We don’t meet any Germans in person, but they are up to dastardly tricks anyway, and the nobility and honour of our plucky British hero is there to be proven by the simple girl whose heart he’s won. Class difference in relationships is certainly brought up in this novel, as something that is becoming less important but still has to be overcome, and there is a clear feeling that the war is acting as an equalising force.